My life was a constant struggle with my weight. I tried every diet or gimmick in the book but nothing worked. I would lose some weight but always put what ever I lost back on plus some extra. I was absolutely miserable. My health was deteriorating to the point my sleep apnea was so bad I was on oxygen and almost maxed out on the pressure the machine could give me. My blood pressure was out of control, my knees were in desperate need of repair but I was almost 400 lbs. I was getting more and more depressed and more and more ashamed of my lifestyle. I have been heavy most of my life, but now it was a very serious health issue. 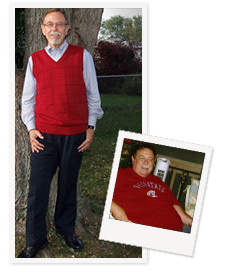 I was only 56 years old, my kids were grown and it was time my wife and I could relax and look forward to retirement but it didn't seem like I had much of a future if I didn't lose weight and keep it off. My brother had decided to have the Lap Band surgery and did very well with it. After visiting him on vacation, I was so impressed with his results and his new lifestyle when we got back I started checking around different Hospitals that offered the Lap Band Surgery. I happened to talk to a friend of mine at church about her weight loss and she told me about the Barix Clinics and how impressed she was with them and how much they understood what being obese was like. I called and made an appointment for a consult. I too was impressed and I had no doubt I wanted the Lap Band Surgery so I started the process. I came across one big roadblock when my insurance wouldn't cover it but I was determined. After talking it over with my wife, we decided it was too important so Barix Clinics worked with me to find other options for payment. My life has done a complete turn around to where I am now LOVING LIFE and LOVING ME! I have lost 217lbs. from my highest weight of 391lbs. * I have had my knee surgery and can enjoy exercising each day pain free in my joints. My blood pressure is normal and I am now officially free of sleep apnea which has even amazed my doctors. I now walk 30 to 40 minutes in the morning about 5 or 6 times a week, I go to the gym and lap swim for 30 minutes minimum, 5 days a week. When I first started to exercise, I couldn't even walk around the block or do one lap in the pool but slowly I built myself up to where I am today. I can do all the things I have wanted to do like golf and bowl, swim, go to a ball game and sit comfortably in the seat or just play with my grandchildren. I now have regained the confidence I had lost and now I have a bright future to look forward to but presently I am definitely enjoying my life each and every day. Having the Weight Loss Surgery was the best decision I could of made, having it done at the Barix Clinic was the next best decision I made. I could not of been more pleased with the care I received at the Clinic before, during and after my surgery. The staff made sure I knew what my instructions were once I got home and made sure I knew who to call if I needed anything. I had to change a lot of bad habits in my life. It wasn't easy. I had to force myself to exercise, even when I didn't want to, because it hurt, but it got easier after each time. I had to listen to what I was told to do by my Doctor, Nurse and Nutritionist and I mean really listen and follow their directions to the letter. I remember my nutritionist, Katie, telling me what I could and couldn't eat and she was always available if I had questions. I recommend you have a support system to get you through the tough times learning to change your eating habits. I was so fortunate to have my wife Linda who was my rock throughout the whole process and supports me still today with my maintenance plan. If you're tired of setting yourself up for failure with diets and gimmicks, call your Barix Clinic and let them explain how they can help you take control of your life and you too can enjoy a new healthy lifestyle.